Currently third in the Countdown to the Championship point standings, Force covered the 1,000-foot distance in 3.881-seconds at 331.04 mph on her second pass under the lights to pick up three bonus points as class leader. Force, the regular-season point-leader heading into the six-race playoffs, rebounded from an opening-round pass of 4.120-seconds at 309.20 mph run with cylinders out. “I definitely thought there would be teams that would run around us. The conditions were so good,” said Force, driver of the Advance Auto Parts Chevrolet Camaro SS. “Obviously, we didn’t have a great run in Q1 when we dropped some holes. Since we were one of the first cars out for Q2 you kind of show the rest of the teams what the track can do. Force, of John Force Racing, will attempt to lock up her 12th No. 1 qualifier of the 2018 season Saturday. Ron Capps, the 2016 world champion from Don Schumacher Racing, is second after a pass in 3.909-seconds at 323.89 mph in his NAPA Auto Parts Dodge Charger R/T, while Bob Tasca III’s run of 3.915 at 320.58 in his Motorcraft Ford Mustang has him third. Point-leader J.R. Todd of Kalitta Motorsports _ winner of the Countdown opener at Maple Grove Raceway last Sunday _ went 3.928 at 323.66 in his DHL Toyota Camry and is seventh. Clay Millican (Top Fuel), Jeg Coughlin Jr. (Pro Stock) and Eddie Krawiec (Pro Stock Motorcycle) also are provisional No. 1 qualifiers in their respective categories at the 20th of 24 national events and second of six races during the 2018 NHRA Mello Yello Drag Racing Series Countdown. Steve Torrence (Top Fuel), Capps (Funny Car), Greg Anderson (Pro Stock) and LE Tonglet (Pro Stock Motorcycle) were last year’s winners of an event that will be televised on FOX Sports 1, including live final eliminations coverage starting at 2 p.m. (EDT) on Sunday. Top Fuel’s Millican will look to secure his ninth pole of 2018 following his 1,000-foot pass Friday of 3.692-seconds at 329.83 mph in the Parts Plus/Great Clips dragster. Millican began the weekend tied for second in the point standings with eight-time world champ Tony “The Sarge” Schumacher and his U.S. Army dragster. Point-leader Torrence _winner of the Countdown opener last Sunday at Maple Grove _ sits second with a run of 3.717 at 326.48 in his CAPCO Contractors/Torrence Racing dragster. He is followed by father Billy Torrence after his pass of 3.735 at 328.06. In Pro Stock, Coughlin took the lead during the second qualifying session with his quarter-mile pass of 6.516-seconds at 210.54 mph in the JEGS.com/Elite Performance Chevrolet Camaro SS. Coughlin, looking to secure his third pole this season and 26th of his career, currently is sixth in the “Factory Hot Rod” standings. Vincent Nobile sits second after a pass of 6.519 at 211.49 in his Mountain View Tire & Auto Camaro, while two-time world champ Erica Enders is third at 6.521 and 211.10 in her Melling/Elite Motorsports Camaro. Krawiec, the four-time/reigning world champ, paces Pro Stock Motorcycle via his quarter-mile run of 6.820-seconds at 195.56 mph aboard his Screamin’ Eagle Vance & Hines Harley-Davidson Street Rod. Krawiec is chasing his third pole of the season and third of his career at the facility near downtown St. Louis. Harley-Davidson teammate Andrew Hines, a five-time world champ, is second after running 6.835 at 195.34 while Chip Ellis is third at 6.845 and 192.93 aboard a third H-D Street Rod. Hector Arana Jr. _ winner in Pro Stock Bike at the Countdown opener at Maple Grove _ is fifth at 6.877 and 195.59 aboard his Lucas Oil EBR. Qualifying is scheduled to continue at 2:15 p.m. on Saturday. FOX Sports 1 will air 90 minutes of qualifying on “Sunday Nitro” beginning at 8 a.m. (EDT), followed by three hours of live finals coverage at 2 p.m. Veteran crew chief Jim Oberhofer has been released from Kalitta Motorsports and his tuning duties on the Mac Tools Top Fuel dragster driven by Doug Kalitta. The decision was announced Tuesday be team-owner Conrad “Connie” Kalitta. Troy Fasching will serve as crew chief for the Mac Tools team during the remaining five races of the Countdown to the Championship playoffs. 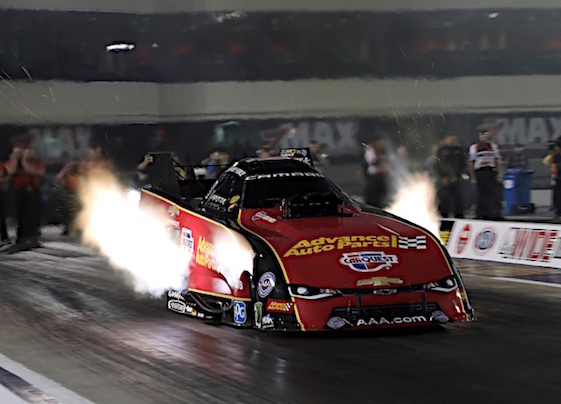 Kalitta was knocked out of the Countdown opener last Sunday at Maple Grove Raceway in Reading, Pa., by Clay Millican in the quarterfinals. Kalitta began Friday’s AAA Insurance NHRA Midwest Nationals at Gateway Motorsports Park in Madison, Ill., sixth in the standings, 116 points behind leader Steve Torrence. Kalitta’s best 1,000-foot lap Friday during time trials of 3.801-seconds at 320.81 mph placed him 13th on the provisional ladder. Oberhofer was a member of Kalitta Motorsports for over 30 years and held numerous positions, including Vice President of Operations as well as crew chief on Kalitta’s dragster. Oberhofer helped Kalitta secure multiple top-10 point finishes in drag racing’s premier division. Oberhofer is a second-generation drag racing enthusiast whose father, Dave, campaigned a Jr. Fueler as well as a Top Fuel dragster in the 1960s and 1970s. Jim Oberhofer landed his first drag racing job in 1983 as a parts-cleaner for Kalitta Motorsports, eventually graduating to a part-time position with the team. Brother Jon Oberhofer also is an accomplished crew chief. Additionally, Jim Oberhofer authored a book, Top Fuel for Life, that was released in 2015. “I want to thank Jim for his years at Kalitta Motorsports and appreciate everything he accomplished here. I wish him the best in the future,” Connie Kalitta said in a statement. Top Fuel _ 1. Clay Millican, 3.692-seconds, 329.83 mph; 2. Steve Torrence, 3.717, 326.48; 3. Billy Torrence, 3.735, 328.06; 4. Blake Alexander, 3.760, 326.08; 5. Leah Pritchett, 3.761, 325.69; 6. Tony Schumacher, 3.762, 328.06; 7. Richie Crampton, 3.774, 320.05; 8. Mike Salinas, 3.787, 324.28; 9. Antron Brown, 3.794, 321.81; 10. Scott Palmer, 3.795, 322.96; 11. Pat Dakin, 3.796, 322.58; 12. Terry McMillen, 3.797, 320.51; 13. Doug Kalitta, 3.801, 320.81; 14. Brittany Force, 3.835, 317.72; 15. Shawn Reed, 3.842, 321.96; 16. Luigi Novelli, 4.010, 217.98. Not Qualified _ 17. Lex Joon, 4.244, 202.45. Funny Car _ 1. Courtney Force, Chevy Camaro, 3.881, 331.04; 2. Ron Capps, Dodge Charger, 3.909, 323.89; 3. Bob Tasca III, Ford Mustang, 3.915, 320.58; 4. Tommy Johnson Jr., Charger, 3.918, 326.40; 5. Tim Wilkerson, Mustang, 3.924, 325.53; 6. Robert Hight, Camaro, 3.925, 325.37; 7. J.R. Todd, Toyota Camry, 3.928, 323.66; 8. Jack Beckman, Charger, 3.929, 326.00; 9. John Force, Camaro, 3.954, 327.82; 10. Shawn Langdon, Camry, 3.957, 322.96; 11. Jonnie Lindberg, Mustang, 3.996, 315.71; 12. Del Worsham, Camry, 4.001, 321.73; 13. Cruz Pedregon, Camry, 4.028, 313.29; 14. Matt Hagan, Charger, 4.103, 253.33; 15. Jack Wyatt, Charger, 4.192, 289.63; 16. Jim Campbell, Charger, 7.192, 88.51. Not Qualified _ 17. Dale Creasy Jr., 10.715, 72.16; 18. Terry Haddock, 11.261, 77.57. Pro Stock _1. Jeg Coughlin Jr., Chevy Camaro, 6.516, 210.54; 2. Vincent Nobile, Camaro, 6.519, 211.49; 3. Erica Enders, Camaro, 6.521, 211.10; 4. Jason Line, Camaro, 6.530, 211.59; 5. Tanner Gray, Camaro, 6.534, 211.20; 6. Bo Butner, Camaro, 6.536, 211.83; 7. Deric Kramer, Camaro, 6.536, 210.18; 8. Chris McGaha, Camaro, 6.537, 211.39; 9. Greg Anderson, Camaro, 6.540, 211.63; 10. Fernando Cuadra, Camaro, 6.558, 210.83; 11. Drew Skillman, Camaro, 6.566, 211.10; 12. Val Smeland, Camaro, 6.624, 208.14; 13. Kenny Delco, Camaro, 6.625, 208.62; 14. Charlie Westcott Jr., Ford Mustang, 6.743, 204.05; 15. Mark Hogan, Pontiac GXP, 7.466, 145.27; 16. Robert River, Chevy Cobalt, 8.246, 124.91. Not Qualified _ 17. Alan Prusiensky, 11.094, 80.14. Pro Stock Motorcycle _1. Eddie Krawiec, Harley-Davidson, 6.820, 195.56; 2. Andrew Hines, Harley-Davidson, 6.835, 195.34; 3. Chip Ellis, Harley-Davidson, 6.845, 192.93; 4. Matt Smith, Buell, 6.852, 196.19; 5. Hector Arana Jr., EBR, 6.877, 195.59; 6. Angie Smith, Buell, 6.877, 193.85; 7. Steve Johnson, Suzuki, 6.881, 193.99; 8. LE Tonglet, Suzuki, 6.889, 193.29; 9. Jerry Savoie, Suzuki, 6.908, 192.82; 10. Kelly Clontz, Suzuki, 6.943, 192.49; 11. Mark Paquette, Buell, 6.956, 191.32; 12. Scotty Pollacheck, Suzuki, 6.968, 190.67; 13. Jim Underdahl, Suzuki, 6.976, 192.00; 14. Ryan Oehler, Buell, 6.979, 191.95; 15. Angelle Sampey, Buell, 6.980, 183.32; 16. Hector Arana, Buell, 6.982, 195.25. Not Qualified _ 17. Joey Gladstone, 7.001, 191.38; 18. Karen Stoffer, 7.046, 192.17. Mike Janis raced to the provisional pole position at the E3 Spark Plugs NHRA Pro Mod Drag Racing Series presented by J&A Service portion of the AAA Insurance NHRA Midwest Nationals. This weekend’s Pro Mod racing, presented by Real Pro Mod Association, is the ninth of 12 races in 2018. Rick Hord moved into the second position with his run of 5.729 at 256.16. Jim Whiteley is third at 5.729 at 250.55 and Steve Jackson is fourth following his pass of 5.733 at 250.88. Pro Modified _ 1. Mike Janis, Chevy Camaro, 5.725-seconds, 248.02 mph; 2. Rick Hord, Chevy Corvette, 5.729, 256.16; 3. Jim Whiteley, Camaro, 5.729, 250.55; 4. Steve Jackson, Camaro, 5.733, 250.88; 5. Michael Biehle, Ford Mustang, 5.754, 255.97; 6. Jeremy Ray, Corvette, 5.755, 248.93; 7. Jason Scruggs, Camaro, 5.756, 248.98; 8. Danny Rowe, Camaro, 5.764, 252.66; 9. Rickie Smith, Camaro, 5.772, 250.37; 10. Mike Castellana, Camaro, 5.781, 250.60; 11. Shane Molinari, Pontiac Firebird, 5.810, 254.38; 12. Brandon Snider, Corvette, 5.811, 245.09; 13. Erica Enders, Camaro, 5.819, 251.58; 14. Todd Tutterow, Camaro, 5.821, 245.23; 15. Steve Matusek, Camaro, 5.824, 249.81; 16. Chad Green, Corvette, 5.828, 247.57. Not Qualified _17. Michael Bowman, 5.894, 255.24; 18. Marc Caruso, 5.911, 194.30; 19. Dan Stevenson, 6.101, 197.86; 20. Khalid alBalooshi, 6.466, 152.31; 21. Steven Whiteley, 6.847, 147.92; 22. Chip King, 7.004, 155.58; 23. Keith Haney, 7.527, 126.01; 24. Bob Rahaim, 8.512, 138.19; 25. Clint Satterfield, 8.969, 107.66; 26. Doug Winters, 9.375, 96.61; 27. Harry Hruska, 9.714, 92.73; 28. Pete Farber, 12.607, 71.26.